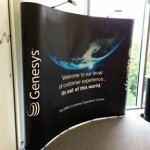 Following many years of providing innovative exhibit environments we were tasked with creating a Customer Experience Centre for Genesys at their new UK offices in Frimley, Surrey. 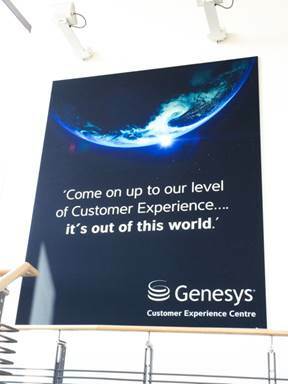 The brief was to physically and graphically demonstrate that Genesys is the market leader in multi-channel customer experience and contact centre solutions in the cloud and on premises. 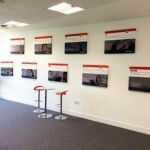 We designed a welcome/reception area, a theatre discussion suite and a 3-in-1 demonstration room which detailed how the CX factor can be achieved from the home contact centre and back office. 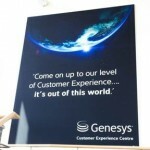 A large welcoming graphic image to the entrance of the suite. 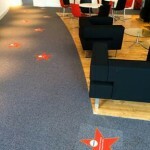 The ‘walk of fame’ based on the famous Hollywood Boulevard, however in Frimley we provided anti slip printed PVC stars cut in to the carpet tiles.